If you are a small business owner waiting to get definitive word on the long-term future of health care regulations, then you will have to wait a bit longer. For now, however, the immediate future is more certain than it has been for many months. This is due to the Senate voting against Republican efforts to replace or repeal the Affordable Care Act (ACA), with the final proposed bill losing a vote in the early hours of July 28th. With this rare moment of temporary certainty, now seems like a better time than ever to take a step back and assess where things are at and what to look out for in the future. Back in March, Republicans in the House of Representatives drafted the American Health Care Act (AHCA), their proposed replacement for the ACA. However, the bill did not have enough support and was withdrawn from consideration by the end of March. In early May, changes were made to the AHCA in order to gain the additional support it needed to pass the House of Representatives, which it did on May 4th. The AHCA was passed to the Senate but never brought to discussion. In late June, Republicans in the Senate drafted the Better Care Reconciliation Act (BCRA), their own ACA replacement plan, but its initial form draws criticism and is unlikely to receive the 50 votes it needs to pass the Senate. Senate Republicans make small changes to the BCRA in mid-July, hoping to gain necessary support for it to pass. On July 17th, two Republican Senators, Jerry Moran from Kansas and Mike Lee from Utah, announce that they will not support the BCRA. This seemed to mean the bill lacks the votes needed in order to pass it through the senate. Senate Republican Majority Leader Mitch McConnell and President Donald Trump pushed for a “repeal and delay” strategy, where Congress would vote to repeal the ACA then delay crafting replacement legislation for the future. On July 19th, the repeal and delay strategy was prevented from moving forward when three Republican Senators, Susan Collins from Maine, Shelley Moore Capito from West Virginia, and Lisa Murkowski from Alaska, announced they would not support the measure, leaving it short of the votes necessary for it to pass. On July 25th, the Senate voted on whether to begin debate on repealing and/or replacing the ACA, resulting in a 50-50 tie, with Vice President Mike Pence voting yes to pass the motion. Over the next few days, the Senate debated multiple versions of bills to either replace or simply repeal the ACA. However, despite Republicans holding a 52-48 majority in the senate as well as the tie-breaking vote in the Vice President, none of these efforts had enough support among Republicans to receive the necessary 50 votes to pass. In the early hours of July 28th, the Senate voted on its final iteration of a health care bill, the Health Care Freedom Act (HCFA), during this period of debate. The HCFA failed to pass with a vote of 49-51, with all forty-eight Democrat and three Republican Senators, Susan Collins from Maine, Lisa Murkowski from Alaska, and John McCain from Arizona, voting against it. At this point, it seems that the ACA and its regulations are to stay in tact for the foreseeable future. While action could still be taken against the ACA in a couple ways by the Trump administration, none of these tactics still available involve either repealing or replacing the ACA anytime soon. This means that any future changes in health care regulations are likely to come from lengthy processes in congress. With these recent events, it also means that changes are more likely to come in the form of revisions to existing ACA regulations instead of those being repealed or replaced. While things can always change in surprising ways when it comes to politics, and congress in particular, the laws and regulations that impact you as a small business owner seem to be set for the time being. Is your company in complete compliance with the ACA and its regulations? If not, or you aren’t sure, then it’s past time that you changed that. Changes to the ACA and its regulations still may be on the way at some point, but the road to those possibilities is a long one. For now, it’s important that you are in compliance with the ACA’s regulations. That means if you are an employer with 50 or more workers, you are mandated to offer insurance to your employees or face steep penalties. If you are not sure, or are tired of spending so much time worrying about things like compliance and paperwork that you don’t have any time to run your company anymore, then maybe you should consider partnering with a PEO. 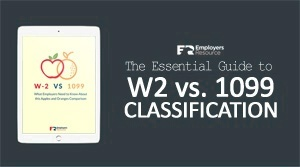 A PEO like Employers Resource already has the experts in place to ensure your company is in complete compliance. You will no longer have to deal with the headache of keeping up to date on the miles of constantly changing regulations or the tumultuous political climate just to run your business. Instead, you will be able to focus on running your business the right way without mountains of administrative details keeping you up at night.